We lack cutting edge. ‘ We are not ruthless enough. ‘We don’t score enough goals. These are just some of the comments that have been coming into us on The Final Whistle on BBC Sussex in the last week or so. There can be no doubt that the Seagulls have struggled to convert the chances they have created. On Tuesday against Reading, the statistics read 22 shots, five of which were on target, but just one goal. The players are definitely getting into promising situations but haven’t done themselves justice in front of goal. There is however, the shining light of the team’s creative dynamo - Anthony Knockaert. He’s the club’s highest league scorer so far, but maybe more significantly, he remains the only Brighton midfielder to score in the Championship this season. I’m sure more goals will come for Glenn Murray and Tomer Hemed but there is an element of reliance on the French winger to make things happen and win games. Of course, over the years there have been players like him who have that spark, that energy and that drive to get fans off their seats. From George Best to David Ginola, Eric Cantona to Ryan Giggs, football across decades has provided some wonderful attacking players. The speed of the game has no doubt increased over the years, so it may be more difficult to find these gems to tantalise, but another argument is that player find it more difficult to defend in the modern era. It may be wrong to compare players from different times, but we all need stars like Knockaert. The fans who went along to watch the defeat to Reading in the EFL Cup on Tuesday may not have been offered too much entertainment but that after all is what sport is. Every fan of course wants the team to win, however they also want to see something, someone special. The Arsenal team under George Graham were renowned for their 1-0 victories, prompting the chant from the terraces, but are they remembered fondly? 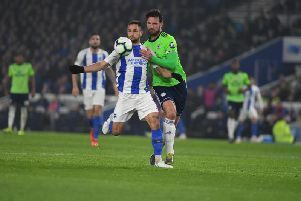 Albion will be grateful for their past two victories by that same 1-0 scoreline but we should all marvel at the skill of those go-getters, those match-winners, those entertainers. There aren’t many but in Anthony Knockaert the Seagulls have a player who can put bums on seats and then get those bums off them again during the match. Long may it continue. This Saturday we may all have to sing along to La Marseillaise on the show after 5pm if he provides the inspiration for another win but it will probably have been worth it. Vive La Difference.